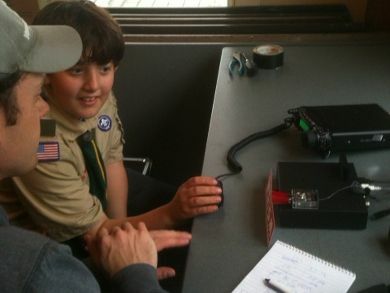 BATH, ME - On October 20th, the WSSM team set up a JOTA station during the Boy Scouts Camporee weekend at the Maine Maritime Museum. Operating on battery power, they used a dipole antenna for 40 meters and a BuddiPole rotatable dipole for 15 and 20 meters. The transceiver used was a Yaesu FT-857D, operating from inside the museum, overlooking the Kennebec River and the historic Percy and Small Shipyard. 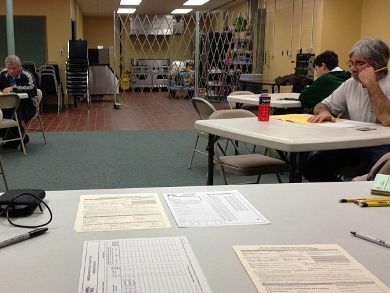 On November 16th, the WSSM VE team held its first exam session of the year at the Gorham Recreation Department. Prospective hams stopped by, pencils in hand, ready to tackle the 35-question Technician Class Exam, with hopes of earning their first amateur radio licenses. 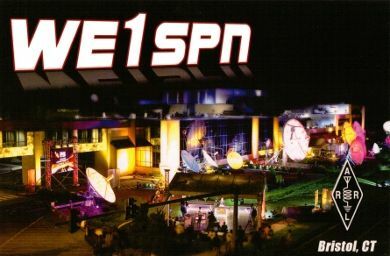 Here's an interesting QSL card from a club located on the campus of the ESPN Sports Network, in Bristol, CT. Members include employees and retirees of ESPN. (Contact made by KB1HNZ on 40 meters SSB). At November's club meeting, Roger Pience N1XP, supplied kits of his own design and helped members build miniature code practice oscillators. 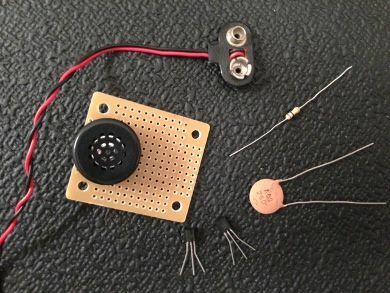 The kits are relatively easy to build and only require a battery connector, 100k resistor, .50uF capacitor, a couple of transistors, and a small solderable bread board. It's also recommended that you include a couple of leads or posts to attach a straight key. 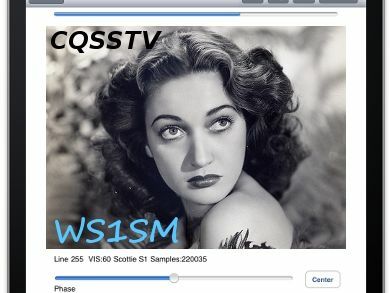 Until recently, decoding and displaying Slow Scan Television images required a sound card-equipped pc or laptop, but with the new SSTV app (by Black Cat Systems) for your iPhone or iPad, displaying SSTV images can be as easy as holding your phone near a receiver. I decided to give the app a try on both HF SSB and 2 meters FM, and the results were impressive. Morse Telegraph Club Members Play a Key Role in Speilberg's "Lincoln"
Members of the Morse Telegraph Club, an association of retired railroad and commercial telegraphers, historians, radio amateurs and others with an interest in the history and traditions of telegraphy and the telegraph industry played an important role in the production of "Lincoln." According to James Wades WB8SIW, International President of the Morse Telegraph Club, several members provided period telegraph instruments for use in the construction of the War Department Set. Click here to view items for sale, upcoming hamfests, announcements, and wanted items. The Wireless Society of Southern Maine would like to welcome new members: Dakota Dumont KB1YYC, Robert Burns W1LBV, Joe McGee NX4T, and Danny Hooper KB1YYB. At a recent informal meeting, one of our members asked whether Summits on the Air stations prefered to operate on specific frequencies on the HF bands, and whether or not there were any "tricks to finding them." Although I've worked several SOTA stations on HF, I wasn't quite sure of the answer, so I began to do some research to find out. One of the best resources for learning about upcoming and current SOTA expeditions is a website called SOTA Watch. 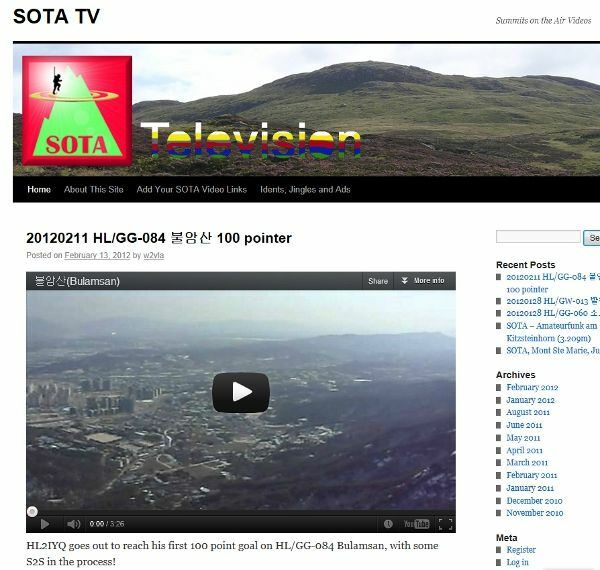 This can be found directly, or via the SOTA main site at http://www.sota.org.uk. SOTA Watch provides some pretty useful information, including the Latest Spots, Upcoming Activations, and access to the Summits Database, which has a listing of every qualifying mountain or hilltop in the world. The SOTA Watch home page offers a quick glance at the five most recent spots (updated every minute), and the five most recent "Upcoming Activations." By clicking on the "Spots" tab, you'll be taken to a full listing of spots, and similarly, if you click on the "Alerts" tab, you'll see a full page listing Upcoming Activations. The Spots listing provides details like call sign, the hilltop designation, and a line for notes. The SOTA number is also an active link, which takes you to the detail page of that particular hilltop in the Summits Database. Click on the Alerts tab, and you'll see a listing of all the reported upcoming activations, arranged by date with the soonest ones at the top. 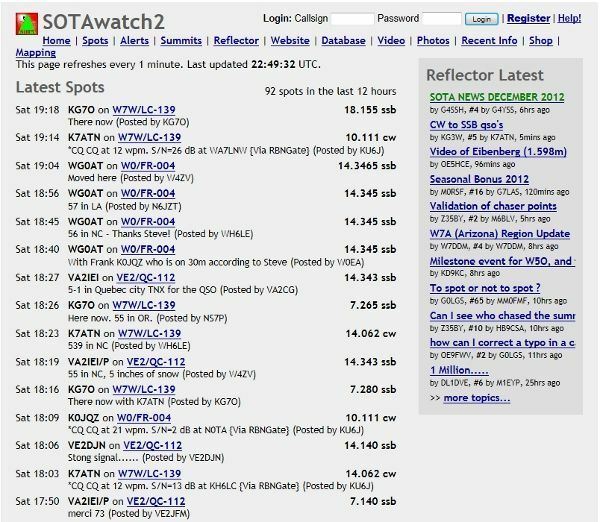 SOTA Watch is practically a one-stop resource for all things SOTA. Other tabs include a link to SOTA TV, where hilltoppers can post videos of expeditions. There's also a photos tab, and a Shop, where you can purchase Summits on the Air gear. 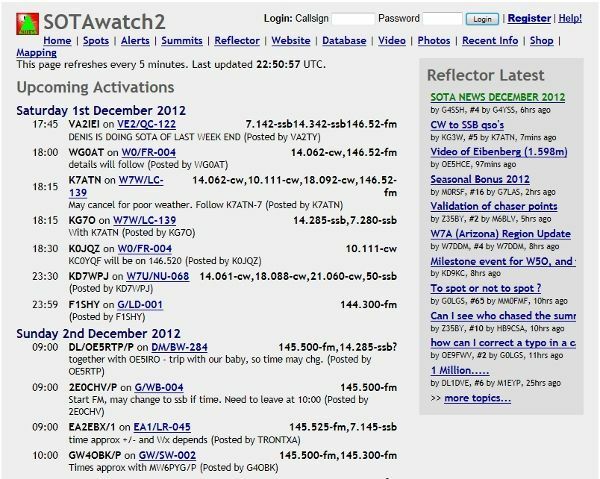 Since the majority of SOTA stations operate QRP and are not easilly picked up on a quick sweep through the bands, SOTA Watch is an invaluable tool - but its not the only place where you can find spots on the web. Another resource that most DX'ers are familiar with is a website called DX Summit. On any given day, SOTA stations are spotted on DX Summit's DX Spots section, but several others are spotted on their QRP page. So, if you're not planning on activating a hill this winter, but still want to take part in SOTA as a chaser, check out the spots, pour yourself a cup of hot cocoa, and have fun. Despite the stresses of shopping and attending parties this holiday season, take some time to reflect and get together with friends and family. Before I close, I'd like to wish everyone a Merry Christmas and a happy Hanukkah, and may 2013 be a more prosperous and blessed year than the one we leave behind. Acknowledgments: "Morse Telegraph Club Members Play a Key Role in Speilberg's Lincoln" Press Release. Morse Telegraph Club. 27 November 2012.